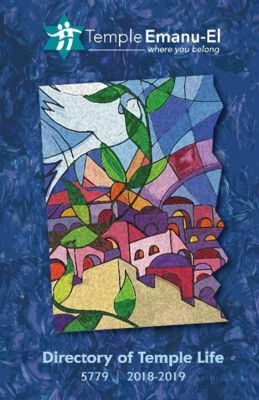 Temple Emanu-El is a family of families, keeping alive our cherished traditions by joyfully sharing Jewish learning, spiritual celebrations, and a commitment to social justice. Here are a few groups you can become involved with. We are group of guys who try to enhance the Temple while building camaraderie and having fun within our Temple family. The Temple Emanu-El Brotherhood supports the Temple through a variety of fund-raising. Our events and projects include: Annual Chanukah Latke fry and sale, and Chanukah family program; pre Pesach Steak and Schmooze Seder; speakers on various topics of interest; attending Detroit Tigers and Toledo Mudhens baseball games; post-Passover pasta party; Havdallah and Hot Dogs event; chili cook-off; and more. Brotherhood helps the Temple in many ways including financial assistance for Congregation picnic and Purim carnival and volunteering at many programs and events. We would love to have you join us. By joining Sisterhood women at Temple can make personal connections with each other. Sisterhood’s fund raising projects (Rosh Hashanah Honey sale, Mahjong Tournament and bi-annual Tapestry Programs), help us to enhance and support the goals and activities of our Sisterhood, our Temple and our National Women of Reform Judaism. Our major goal, providing a Sweet Shabbat for our Congregation by preparing the Onegs for all unsponsored Friday night services, has been very successful thanks to the wonderful participation of many of our membership, who bake or prepare fruit trays. You can also help by donating to The Lillian Greenwald Shabbat Oneg Fund. The garden group meets Sunday mornings mid-May through the fall harvest and plants, waters, and harvests from the vegetable garden on the west side of Temple. Vegetables are delivered to Yad Ezra. Broom corn stalks help decorate the Temple sukkah. All ages are welcome to join us Sunday mornings. Our new Choir is open to members of all ages – you just need to love to sing. We will sing at High Holidays Services and our Festivals and more. Our Multi-Generational Choir can make each year a year of SONG! The mission of this group is to both educate and advocate for social justice. The Committee uses our Reform Jewish values to address local, national and global social action and social justice issues. Activities include Yad Ezra Yom Kippur Food Drive, continued support for the struggling Jewish community in Brovary, Ukraine, involving the Congregation in the Jewish Family Service Light One Candle project to provide Chanukah joy to those in need, educating all about the “gerrymandering – redistricting issue and ballot campaign, and more. Additional social justice issues, including immigration, are being explored. A group of dedicated volunteers provide meals to families grieving a loss and to members following major surgery and during long-term illness. The group brings soup and bread to new moms in our Temple community. People who will contact members, deliver a meal, bake or buy bread, cook soup, and write notes are needed. The volunteers with Caring Community help our Congregation fulfill the mitzvah of caring kindness. As we welcome home Rabbi Matthew Zerwekh, congregants will join together for a meal and introduce Rabbi Zerwekh to the new Detroit restaurant scene. Rabbi Zerwekh is excited to announce a new series – melding the tradition and wisdom of Torah and the Sages with the artistry and creativity of the burgeoning adult beverage scene. We will meet at a brewery or disgtillery to enjoy the ancient science of brewing/distilling while we learn about and discuss the ancient and current wisdom of our tradition. This group works with clergy to ensure Temple offers meaningful and creative avenues to religious observance and spiritual expression. Congregational feedback is always welcome about worship experiences at Temple ant it I shared with clergy. The Committee members work with clergy to obtain participation by members in worship services, we help with Festival/Holiday celebrations and we learn about shiva minyan ritual and lead shiva minyanim. The Music Committee brings music into our Temple life. This group organizes concerts and musical celebrations. Among its programs Temple’s Got Talent, showcasing the musical abilities of our members, the very successful Musicafe series – special musical experiences in homes of members with quality performers, as well as concerts at Temple. Recent performances included performer extraordinaire Heidi Rose, Cantorial Soloist Kelly Onickel, The Cliff Monear Trio, pianist Linda Permut, and harpist Krista Grix. We are welcoming faces as you enter our sanctuary and other worship spaces for Shabbat, Festival and High Holidays services. No special or prior experience necessary, flexible shifts. Join our group and help make the worship experiences at Temple more welcoming for all. The goal of Prime Timers is to provide social activities and events of common interest for adult Temple members. Activities have included visiting Detroit Historical Museum, Masonic Temple Ford Rouge Tour, Little Caesars Arena, an indoor water park and fitness center, and more. Meet new friends and reconnect with others in our this Temple family of adults. Each year at Purim a dedicated group of volunteers prepare packages for purchase by members for delivery to our members and friends. This important project builds relationships and the proceeds fund the Stettner Caring Community fund, which provides comfort and support to those who have suffered a loss or experienced illness or hospitalization. Help us fulfill this Purim mitzvah – send packages to friends and help prepare and deliver them. Teaching and learning with other families about holidays, traditions, customs, and more in areas that are relevant to families. Interested in any of these areas or do you have an interest in something else you would like to see? Please complete the form below and send it to us. Committee etc Sign up List 17-18excel On the current list of committees, please indicate if you wish to serve on one or more and return the form to the office. You can either call or Email Faye or Barbara in our office or send it in using the form below.